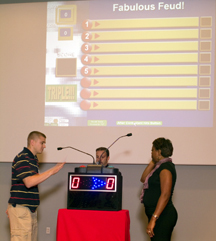 Gameshow - Fabulous Feud - Are you ready for the most popular game show of all time? Survey says... YES! Includes face-off podium, 10 player/family podiums, LCD projector, projection screen, sound system/control panel, speakers, stocked questions, MC and assistant. Other Game Shows include: Game Show Mania, Spin to Win, The Challenge, Music Trivia, Milliion Dollar Question, Take the Deal, and Are You Smarter Than Your Child? ...Or you can create your own trivia challenge! Take The Deal.. Or Not!